I enjoy Christmas baking so much, but this year, there hasn’t really been much time for it. So far. These are a must for me though, no matter how busy I am, I always find the time to make these and pop them in my freezer. I actually just realized there are only two left in there.. I need to make another batch. I generally find most types of Christmas candy too sweet anyway, I mean I adore caramels but I just can’t handle the sweetness. 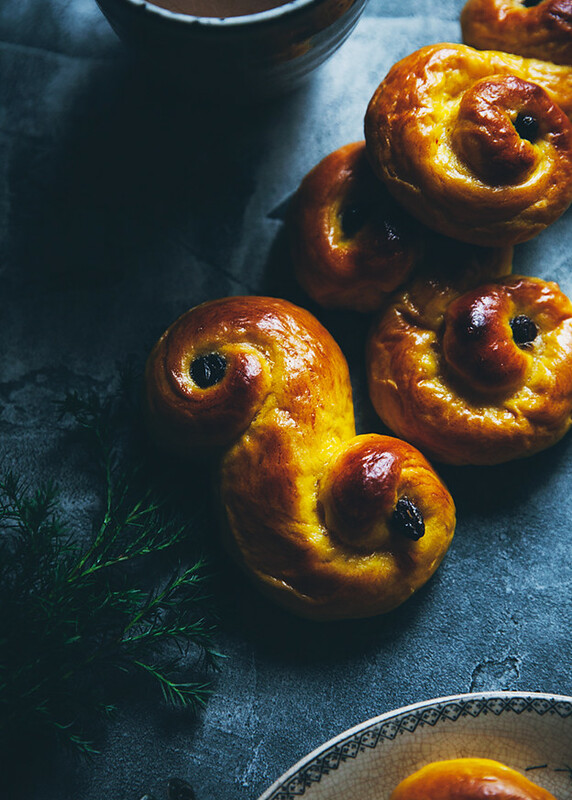 These Lussekatter though, are just perfectly sweet. I adore them. If the buns start feeling dry, reheat them slightly in the oven or in the microwave and they’ll become moist and delicious again! You can easily double this batch and freeze the leftovers. 1. Grind saffron and 1 tbsp granulated sugar in a pestle and mortar. Put in a small bowl and mix with cognac or vodka. This mixture can be prepared up to one month ahead for more flavor, but about 20 minutes before starting the dough works too. 2. Crumble the yeast into a large bowl. 3. Put buttermilk and cream in a saucepan and heat until approximately 37°C (98.5F) Add a little of the liquid to the yeast and stir until it has dissolved, then add the rest of the liquid, the saffron mix, the egg and sugar and stir until sugar is dissolved. 4. Slowly add half of the flour while working the dough with a dough hook in a stand mixer. You can of course also work the dough by hand but it will take longer. Add the salt and the butter and work until incorporated into the dough. 5. Add the rest of the flour (or as much as needed) and work into a very smooth dough, about 10-15 minutes on low by machine. The dough should be very elastic, smooth and sticky to the touch – if you pick up a piece and pull it apart it shouldn’t snap immediately. 6. Leave the dough to rise, covered with a cloth, for 60-90 minutes or until doubled in size. Meanwhile, put the raisins in a bowl and cover them with glögg or water. This is done to not dry out the buns. 7. 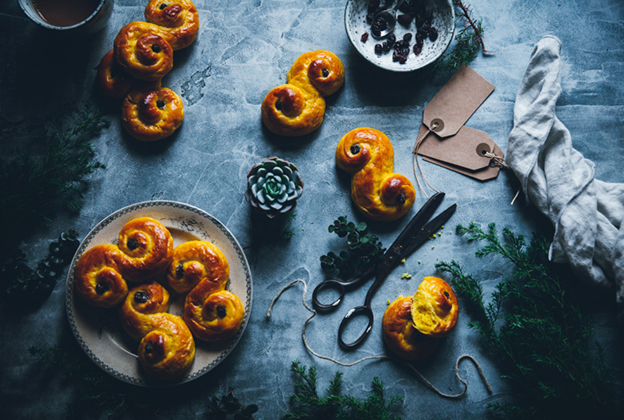 Now it’s time to shape lussekatter! Divide the dough into equally large portions (I used 50 g of dough for each bun) and shape each bun like an “S”. The trick is to roll them out really long to make them extra swirly. Prepare two baking sheets with baking paper. Transfer buns to baking sheets. Leave some space between them as they will rise even more. Put two raisins in each bun (as pictured). 8. Cover the buns with clean kitchen towels and leave to rise for 45 minutes. Preheat oven to 250°C (480F). 9. Brush buns with egg wash. Bake at 250°C (480F) for about 5-8 minutes or until golden brown, depending on the size of the buns. 10. Let cool under a clean kitchen towel. Enjoy! Remember to freeze leftovers immediately once cool or they will become dry very fast. 1. Mortla saffran och socker. Lägg över i en liten skål och blanda med konjak eller vodka. Detta kan förberedas upp till en månad före men 20 minuter går fint det också. 2. Smula jästen i en stor bunke. Värm kärnmjölk och vispgrädde i en kastrull till fingervärme (37°C). Häll lite av vätskan över jästen och rör om tills jästen lösts upp. Häll på resten av vätskan, ägg, socker och saffransblandningen. Rör om tills sockret lösts upp. 3. Tillsätt hälften av mjölet och arbeta i maskin med degkrok eller för hand med en träsked. Tillsätt smöret i klickar och sedan saltet. 4. Tillsätt resten av mjölet och arbeta till en rejält smidig och elastisk deg, cirka 10-15 minuter med maskin eller 30 minuter för hand på bakbord. Täck över skålen med en ren kökshandduk och låt jäsa i 60-90 minuter eller tills degen dubblats i storlek. Under tiden kan du lägga russinen i en skål och täcka med antingen glögg eller vatten. 5. Knåda degen lite lätt och forma sedan till lussekatter (jag använde 50 g deg per bulle) och lägg dem på två plåtar med bakplåtspapper. Dekorera med russin, täck över plåtarna med rena kökshanddukar och låt jäsa 45 minuter. Värm ugnen till 250°C. 6. Pensla bullarna med ett ägg uppvispat med en nypa salt och grädde. 7. Grädda bullarna 5-8 minuter tills de blivit gyllenbruna. Låt svalna under en ren kökshandduk. Yummy! If I use dry yeast, what is the conversion? Does this change any of the instructions? God jul! I've had great success with vegan-izing conchas (Mexican sweet bread), so I am hoping to vegan-ize these as well, using your recipe as a base! Gonna make them for Christmas eve, I'll let you know how it goes! 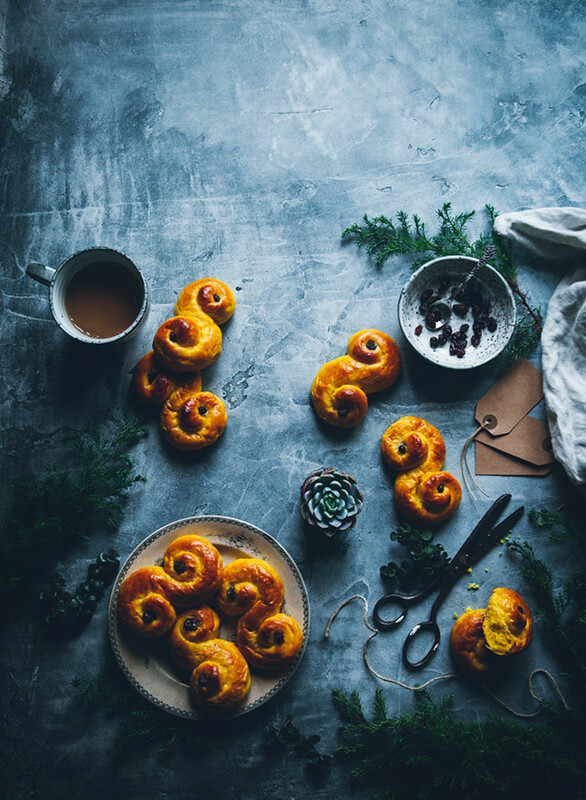 What beautiful saffron buns, they look so tasty! 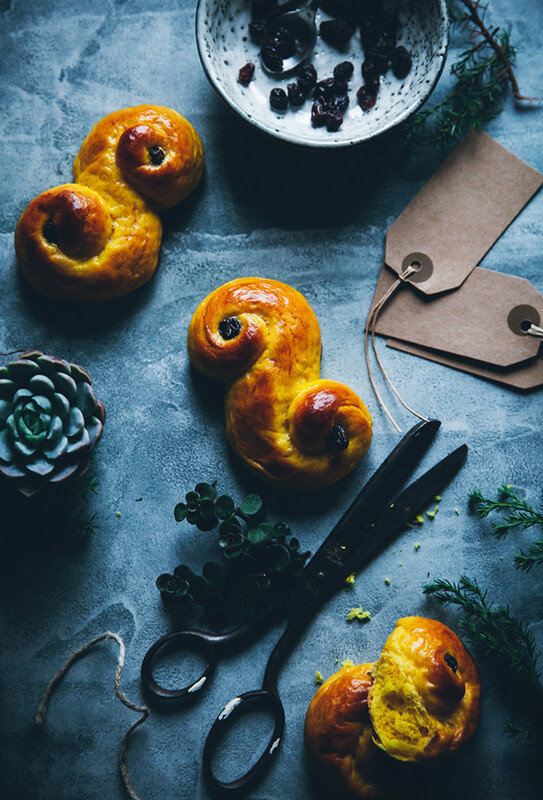 I've never had a saffron bun, I think I need to change that! These are beautiful! 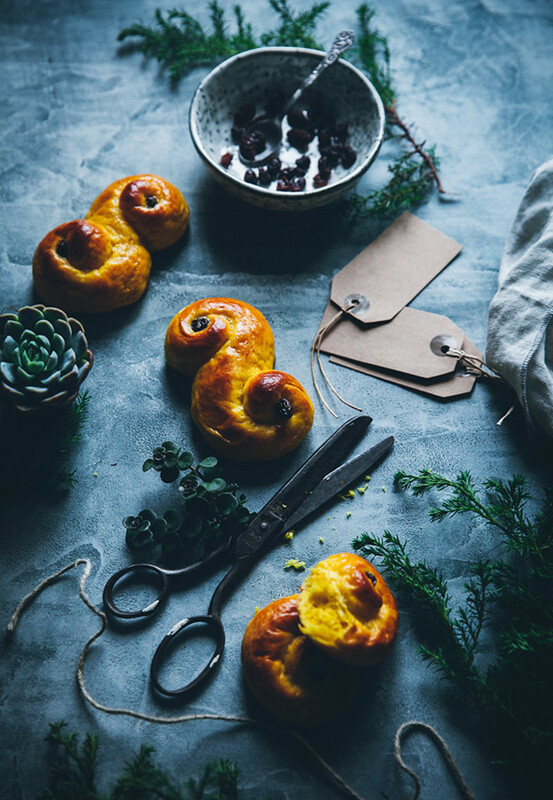 I love saffron buns. Update: I took advantage of a rainy day and finally baked these-vegan style! They turned out beautiful, soft, and moist! I've never had them before, so I don't know how they are supposed to taste, but I think they are pretty good: lightly sweet and the saffron gives it a good flavor and fragrance. 1. for the buttermilk: 2/3 cup soy milk with a scant tablespoon of apple cider vinegar, left for 5-10 minutes to curdle. 4. and for the butter I used an earth balance baking stick. Also, instead of an egg wash I simply brushed them with soy milk. A ceramic bowl of water accompanied them in the oven to ensure that they were moist! My results were posted on instagram, link in my name above! Thank you so much! These look beautiful! They resemble a miniature version of the Greek tsourekia we also make on Christmas/Easter. Wow! Just found your blog and the pictures are amazing! Greetings from Finland. The recipe seems easy enough to give it a try. I might give it a try next week and see how it goes. Thanks for sharing! Amazing! Your recipes and photos are just stunning! Do you have a newsletter? I would really love to subscribe.